Or really, lets just go with tacos any day. They always win. With pretty much everyone. Unless they’re this quinoa version and your feeding well, my family. If you have been reading for pretty much any amount of time, than you know that my brothers don’t eat quinoa. Heck they will not even go anywhere near the stuff. So yeah, this meal was not for them, but they are totally missing out because this is some good Mexican. Same awesome flavor, just a little healthier. I actually almost felt (sort of) bad pulling this out of the oven in front of them the second time. It smelled like tacos, it looked super cheesy, but then one look at the smile on my face and they knew that something was up. Kai called it right away, “wait, there’s no meat in this, is there”? I mean seriously, they know me too well. Whatever, the rest of us quinoa eaters loved this. And I mean, just look at all of this cheese!! I had too. The cheese stretch. Nothin’ better. 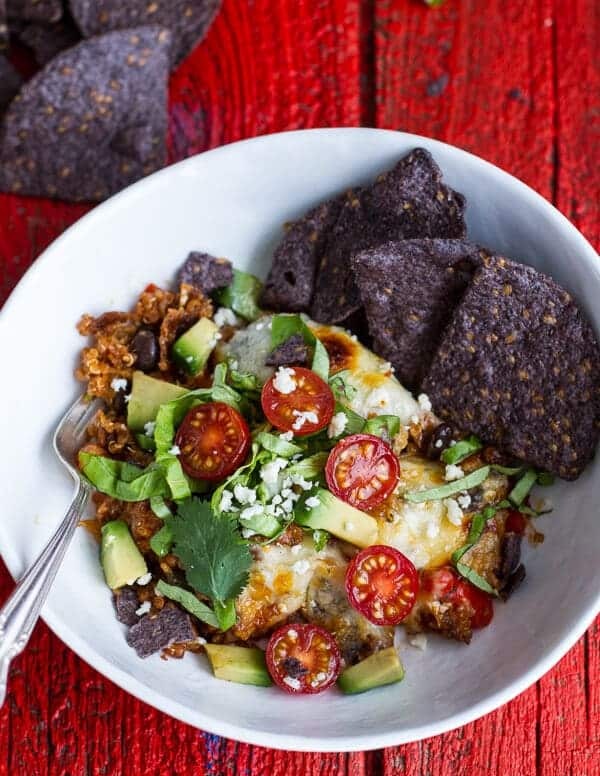 So there’s the cheese, but there is also tortilla chips stirred in with the quinoa making it kind of similar to chilaquiles. If you added a fried egg on top you would be my hero. 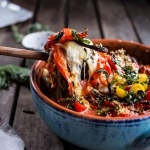 Just like this caprese quinoa bake I made over the summer, this too is super easy to make. This dish has a few more ingredients, but don’t let them freak you out. Promise it is just as easy and quick. Perfect for a mid-week, early spring meal when the weather could be really nice or just plain miserable. 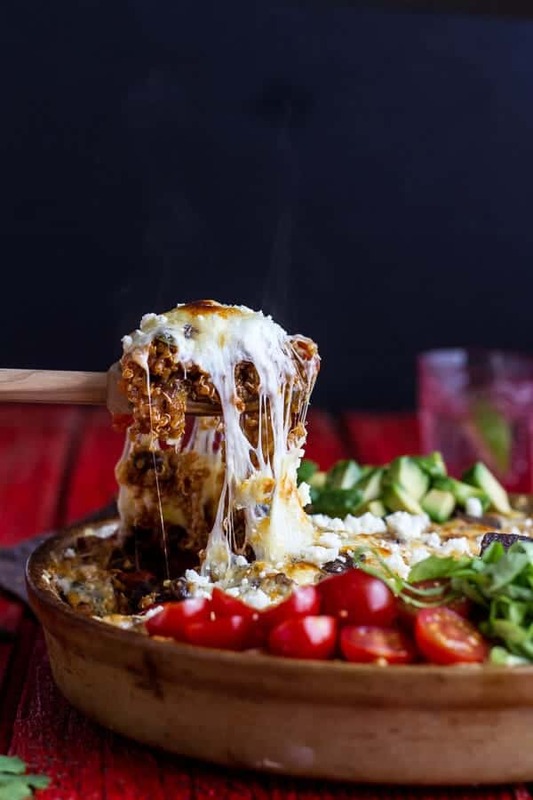 It’s full on snowing here and yet I do believe tomorrow is officially spring, so this healthy, cheesy comfort food is very welcomed. Also, there is queso fresco involved. Just too good. Preheat oven to 350 degrees F. Grease an 8x8 or 9x13 inch baking dish. Heat a large skillet over medium high heat. Once hot add the oil and then the onions, garlic, red bell peppers and jalapeños, cook 5 minutes or until the veggies are soft. To the skillet add the chili powder, cumin, paprika, oregano, pepper, salt and cayenne. Stir in the tomato paste and continue to cook 1 minute. Stir the quinoa and black beans, mix well. Add the lime juice and beer (or water). Simmer until the beer has cooked out, about 5 minutes. Stir in the tortilla chips, pepper jack cheese and some fresh chopped cilantro if desired. Transfer the quinoa to the prepared baking dish. Top with the remaining cheese. 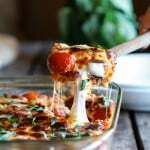 Bake for 10 to 15 minutes and then turn the broiler on and broil for 1 to 2 minutes or until cheese is golden and bubbly. 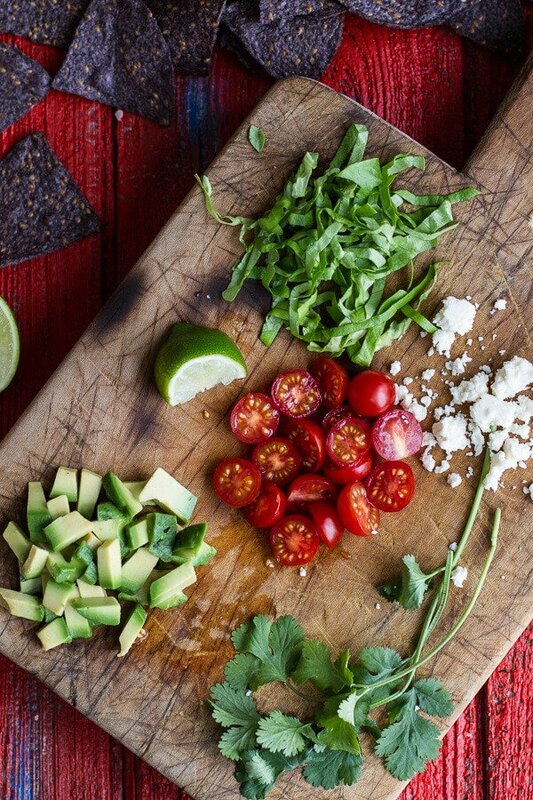 Remove from the oven and top with fresh cilantro, grape tomatoes, diced avocado and tortilla chips. Serve! Oh, double also, those tomatoes you see above – they were delicious. Spring is on its way somewhere! WHY DID I HAVE TO SEE A MOVING CHEESE STRETCH AT 6AM?! Now I just want cheesy taco beak for breakfast. Ugh. This looks so good Tieghan! Me and the hubs are just finally starting to actually like quinoa, so we will have to try this! Haha, Sorry that is early for a cheese stretch! HA! That cheese stretch! Omg, how could anyone resist this dish!? 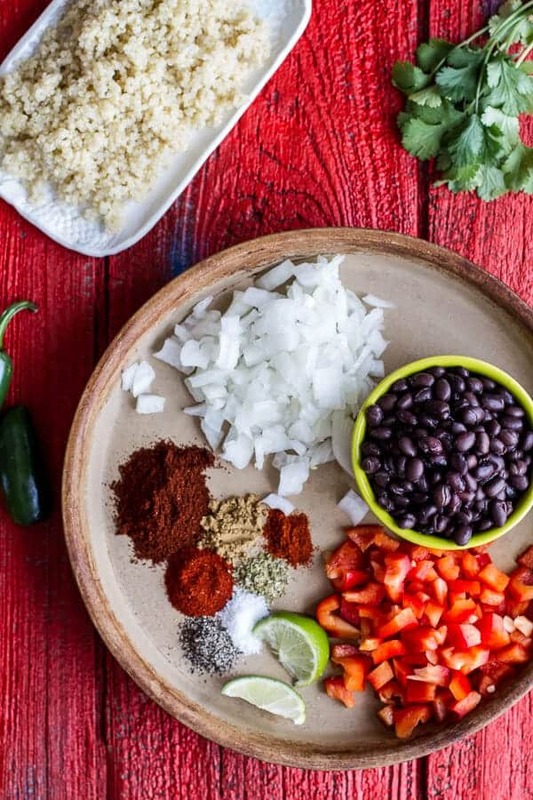 Could one use chicken instead of black beans? For whatever reason, my stomach can’t handle beans, and I’m trying to think of replacements for the beans. Hey Amanda! I think shredded or chopped or even ground chicken would all work great! Just add it in with the quinoa. Thanks so much and I hope you loved this! 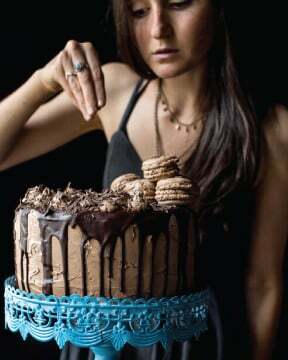 I was dreaming of this exact type of recipe just yesterday! This is probably the best recipe you’ve ever made. I mean that! I want to dig into this! Taco Wednesday!! YES, I think this could totally be a new trend for me. Look at this dish! 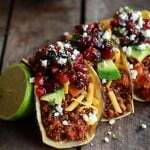 LOVE this spin on tacos and the addition of the quinoa! gorgeous!!! I actually did lol @ Kai’s response, it just sounded so familiar…what is it w/ boys? 1 of my boys will eat anything (think veggies) the other two, strict carnivores! Loved the cheeseeeeenessss, yum! Oh, this looks like a whole bowl of deliciousness! Love that cheese string too. That cheese is calling my name! Oh my word I am speechless! That doesn’t happen too often 🙂 Pinned! omg that cheese pic is soooo cool!! I love how you made it stretch like that! 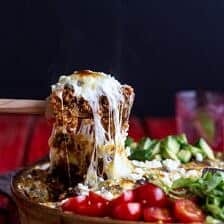 I need this taco bake now! This sounds SO fantastic! 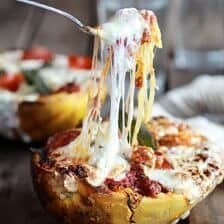 I def want to try this but with vegan cheese! The stretchy cheese is calling my name and I love the red board. That’s gotta be the most mouthwatering gif I’ve seen in months, haha! What a yummy dish full of comforting goodness. 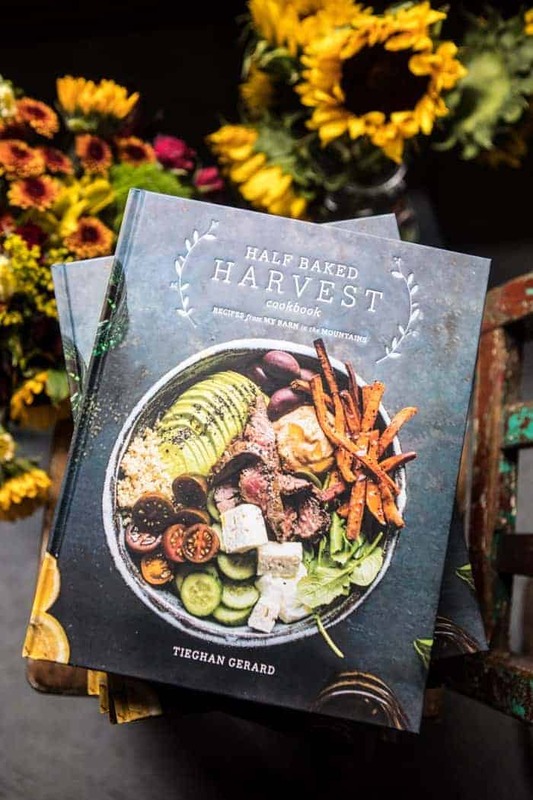 It looks SO flavorful and delicious, Tieghan! Ha! Thank you so much, Georgia!! 🙂 Hope you are doing awesome! It’s a good thing I have all these ingredients already because I *need* this in my life. Immediately. Your brothers are funny – I used to ask my parents if meals had meat in them, but that was because they regularly tried to pass things off as meat that…weren’t. Like “chicken-less” nuggets. At least you’re not trying to fake your brothers out! Oh trust me, I try…but is almost never, ever works. Ha! I am all about some tacos, all day, any day. These look fantastic and your photos are killer! Love that red surface you shot the photos on. 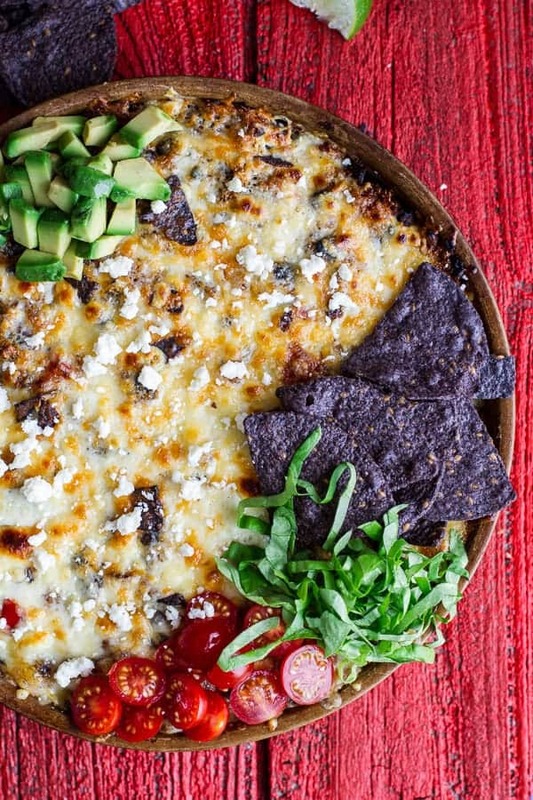 Perfect for this taco bake! Plus I’m dying over just about every ingredient in this. Yum! 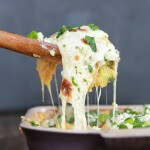 Toootally swooning over that melted cheese! Too bad for your brothers, but more for the quinoa lovers, right? We just got a new bag of quinoa and now I know what to do with it. There was a bit of a rut when all we would do is boil it with chicken stock and serve it next to something. This looks like a far better way to eat it! Oh yeah, this is way more fun that eating it plain! OMG. This is amaaaaaazing! So glad I found this recipe. Pretty pictures too! So wait…your brothers didn’t even try one bite!? That’s crazy. It looks so good!!! And anything with that much cheese is obviously delicious! Definitely want to try this – would be great for parties!! Ha! Nope they did not! omg this looks incredible! I could eat mexican themed meals daily! I’m a huge fan of quinoa. I love the twist you put on this. And the cheese!! Fried egg on top, yes! And sooo pretty with the red tomatoes and blue tortilla chips and green cilantro. This look so good!! I love all the flavors in here! And that video pic of the cheese is awesome! Haha! Thank you and you can always make a beef or chicken version as well! Beautiful! This looks so dang good. The boyfriend (bless his meat loving heart) would probably eat quinoa if I covered it in cheese and flavoured it up like nachos. Might have to fry a few bacon strips for him so that he doesn’t think I’m conspiring to move him to the meatfree camp. Although, I think once he sees that cheese stretch he might be a goner! Haha! I should have tried the bacon, maybe the boys would have eaten this them! You can also through in some ground beef or chicken if needed! You are the master of the “cheese stretch” photo! These are superb (as always)! It’s like you live in some alternate universe where the lighting is always ideal for photography. 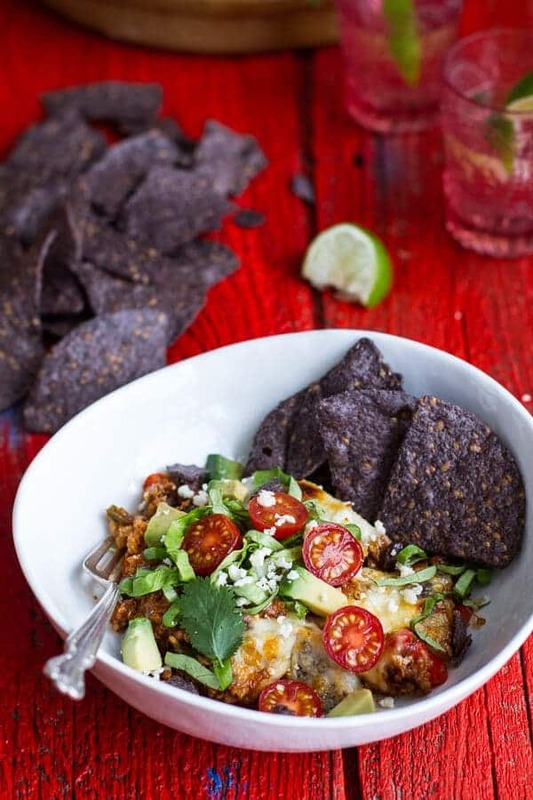 I can’t wait to try this lightened up taco dish!! I love quinoa! Haha! Oh my gosh, I wish!! LOL! You should see me, you would not be saying the same thing. My set up is crazy and far from perfect, but it works! I had taco salad for dinner but this bake looks even better. Who could resist that cheese?! Taco salads are delicious too! Dude, you have got ISSUES. Haha! I actually did the same thing for the meat eaters. Too funny! Tacos definitely always win!! Love this! 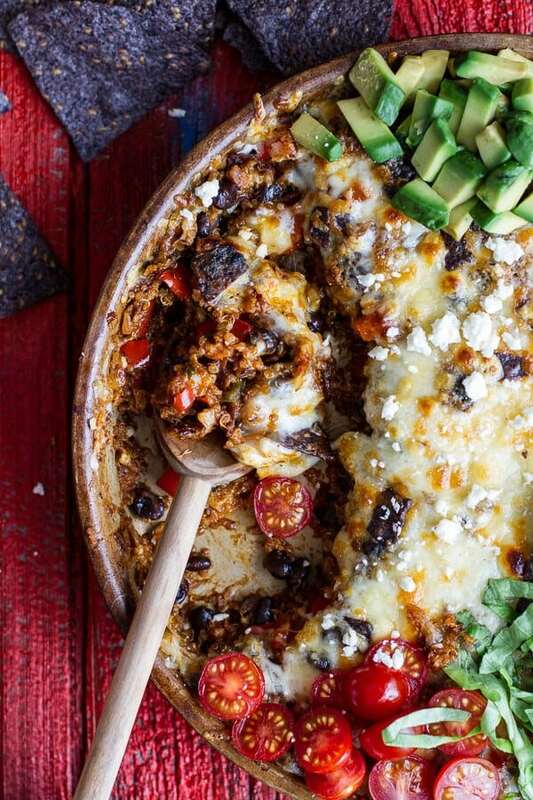 I made a taco & quinoa bake last night, not yours, total coincidence – it was kind of meh. That is what I get for not paying attention! Oh that cheese stretch! Sign me up for a bowl of this deliciousness! Aww! This makes me so happy! Thank you so much for making my stuff. I am thrilled you are enjoying it! this sounds I-N-C-R-E-D-I-B-L-E! Absolutely gorgeous photos! Seriously so sad I dont have an oven in the apt I’m renting for the month in Malaysia otherwise I would be making this ASAP! So happy you loved it!! Thanks! I don’t like quinoa as much as I should as a vegetarian. But I think this might be my cure! I can’t wait to try it! I just found your blog through Pinterest and I completely love it. 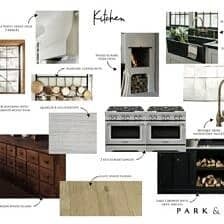 Your recipes are amazing but also the design! 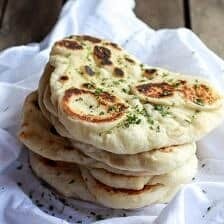 I have been wanting to try moving gifs on my recipe posts but I wasn’t sure how it would work- you are totally totally rocking it! Amazing work! Just wanted to let you know, I made this for Sunday supper & it was awesome. Even in spite of it’s lack of meat, my hubby loved it & went back for more. Another home run for HBH! Aww! This make me so happy! Thanks! First recipe I’ve made of yours; they all look so wonderful! I left the beer out and used water but it was definitely lacking salt, to my taste. So I added in some garlic salt and it was perfect! I doubled the recipe since I’m going out of town this weekend and leaving the husband and kids with a dish to bake while I’m gone. I used one can of black beans and a pound of ground turkey. Everyone had seconds and absolutely loved this! Nice job! So happy you all loved it!!! So, I just realized I’ve been pinning all of your recipes via Food Gawker… Absolutely all of them stand out to me! I actually made this dish tonight and loved it! Anything that satisfies me (a vegetarian) and my meat-eating husband is a definite win. Thanks for sharing and keep it up… I look forward to testing out more of your creations! The gif is made on photoshop. This is amazing. Turned out excellent!! 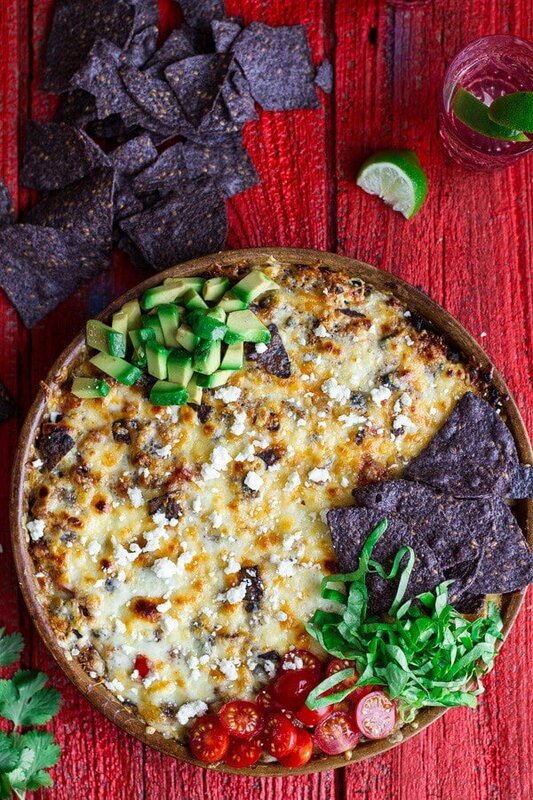 I made it with Doritos & served it with guac + all of your recommended toppings. SOO GOOD!!! Thanks for the recipe. 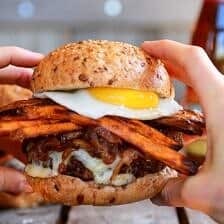 OMG this recipe lead me to your sight and now I have to make it! As everyone before has mentioned, the cheese stretch is a clincher!! But I do have one question. And you may not be able to answer online, but are you using an old Pampered Chef stoneware dish to cook this in? And was wondering if this recipe fits. 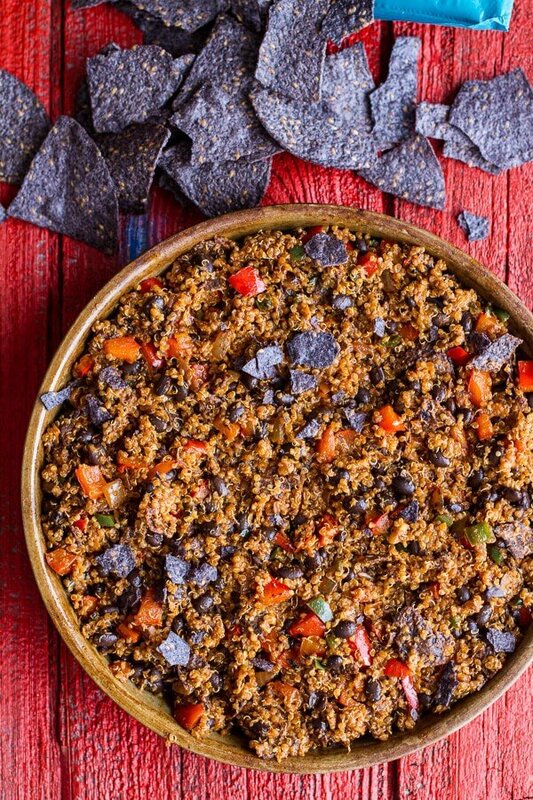 Thank you for this great recipe–trying to get my family to just try quinoa! haha, yes I am. It is my parents from when they got married. The recipe fits perfect in that dish. Thank you so much for the kind words!! Hope you love this dish! Thank you all the way from Australia! Your recipes are always a go to when friends are coming over.